The Church of St John the Evangelist better known as the Afghan Church is a presbyterian church in South Mumbai, India, built by the British to commemorate the dead of the disastrous First Afghan War of 1838. 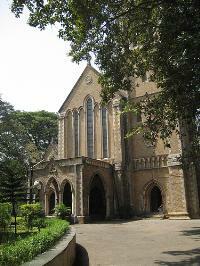 The church is located in Navy Nagar in the Colaba area of Mumbai (Bombay). Besides British soldiers it also commemorates different Indian regiments, such as the Bombay Army, the Madras Army, and Ranjit Singh's army from Lahore. Records also mention that only one person, one Surgeon Bryden - a medical officer, out of 16,000 men returned safely to Jalalabad to tell the tale, a war in which the British suffered a complete rout.